This week I speak with Christine Rogador who is a remote writer who splits her time between South Africa and the Philippines. Christin grew up in a small town in the Philippines but knew she wanted to travel. While her friends were starting families, Christine was trying to find different ways to see the world. She didn't know what to do with her life and decided to leave school to work full time where she found a job which gave her a lot of success. However, the stress and Christine’s need to see the world pushed her to make the decision to leave her job at the height of her career. Today she continues to pursue her passions to travel and is a full-time freelance writer and blogger. Listen on to find out how to live a freedom lifestyle as a remote writer. Ep. 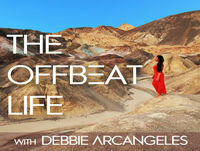 84: My Offbeat Journey: Do you use travel to escape life?